At 8.50 a.m., you will hear the school bell ring. Initially, you will be able to bring your child into the classroom to help them get settled. After a few weeks you will receive a letter informing you that the children will begin to line up on the playground at 8.50 and when the bell rings the class teacher will bring them into class. 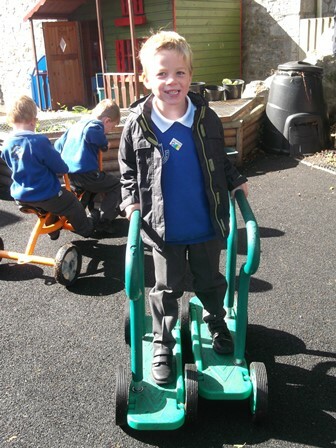 This allows the children to develop greater independence. During the day the children will have carpet inputs followed by Learning Time, an opportunity for children to develop their own learning and follow their own lines of enquiry. During Learning Time children may work in a guided group with an adult to further their learning. Each day the children will have a phonics input, where we will teach them letter sounds and how to read and write. We will do guided reading with your child during this time. During the morning the children will have access to a cafe, where they can have toast and a piece of fruit, as well as a drink of water. Children are encouraged to do this themselves to develop their independence. You will be invited to a meeting in the first half of the Autumn Term where we explain our curriculum and how our day works in greater detail. The children have access to drinking water at all times during the day. If you would prefer, you may wish to provide a drink of water or diluted fruit juice in a named plastic drink bottle. Please do not send fizzy drinks. The children have an hour break for lunch between 12:00 pm and 1:00 pm. Your child will be able to have a school lunch or bring a packed lunch from home. Packed lunches need to be put in a clearly named lunch box and, again, children must not bring sweets, bars of chocolate or fizzy drinks. 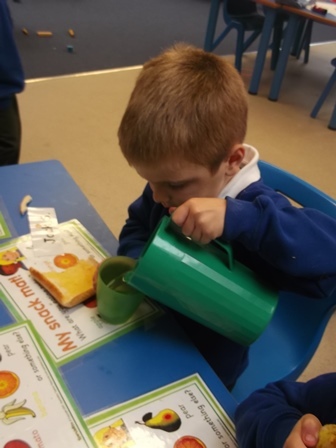 Your child will not need to pay for their school lunch whilst they are in Reception. If you are claiming benefits, it would be helpful if you would still claim for free school meals. Please call into the school office for more information. The school day ends at 3:15pm.